Secular geologists say there has been no global flood as described in the Bible, but vast layers of rocks provide a monumental testimony to this event and God's recent judgment of humankind. This presentation provides an introduction to Creation Geology and a characterization of the geological column that is naturally derived from the Biblical worldview. 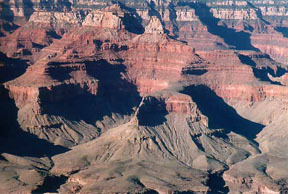 Several important examples are provided that show how strata and canyons can form rapidly rather than over millions of years. In addition, the secular geologic worldviews that form the foundation for interpreting the Earth's crust are examined to illustrate how historical bias against catastrophism has caused erroneous interpretations of geologic features that are now know to have been formed catastrophically. Download Zip File 889 MB - contains PowerPoint and accessory files.